The Ranked Battles Beta Season is here! Start the game, pick a Tier X vehicle, and fight equally skilled players on the battlefield. Put on a great performance, climb the leaderboard, and compete for the top position on the Season Leaderboard. When the season ends, the top 50% of the Season Leaderboard will earn exclusive badges for their results and an all-new game currency, Bonds. Additionally, everyone who registered before 3 June at 02:00 CEST (UTC+2) receives a small gift: 100! These will prove useful in any mode, as you can buy new in-game items with them—Improved Equipment and Directives—that will pimp up your vehicle parameters. Choose your tank and roll out! We're entering the final stretch of Ranked Battles development that’s culminating in a massive Beta Season. It starts June 5, inviting you to get hands-on time with a new slice of the World of Tanks experience. Jump in to face players of comparable skill, rise through the ranks, reap exclusive rewards, and spare a few minutes to let us know about your experiences. Previous tests went great overall and we're grateful to everyone who shared feedback and various bug reports. This time, we want you to check out the near-finished product and outline elements that might need some extra tweaks. The dev team will be monitoring Ranked Battles’ performance closely to see what impact it has in each region and use your feedback to define future enhancements to functionality, rewards, and economics. We put together a pretty comprehensive guide to getting started with Ranked Battles mode ahead of the Beta. However, before you start exploring it, consider going through a special crash course brought to you in this article. The mode (exclusive to Tier X vehicles) tasks two teams of 15 with destroying all opponents or capturing their base. The camp that succeeds in their objective first, wins. Although victory raises your chances of getting a chevron, winning is secondary here. Putting on a great performance and racking up XP is much more important, because your standing on the list of top XP earners determines your progress. Getting in the top 12 by XP on the winning team or in the top 3 on the losing team earns you a chevron, taking you a step closer toward earning a new rank. In other words, you aren’t held back just because the team underperformed at some point. The better your individual result, the higher your standing in the special Ranked Battles ladder, and your rivals are anyone at a comparable rank. The matchmaker makes sure of that. Head over to the Ranked Battles guide to learn more about Personal and Vehicle Ranks, season’s structure, and progression. Along with your usual earnings per battle, a stellar performance in Ranked Battles rewards you with special bonuses for reaching a new rank and fulfilling the exclusive Ranked Battles mission. At the end of a season and its stages, you get a certain number of an all-new in-game currency, bonds, and a crate with rewards. Bonds can be used to stock up on Directives and Improved Equipment. The amount of bonds you get for a stage depends directly on the highest rank you reach during it, e.g., if you reach the 4th, but then go down a rank and end the stage in the 3rd, you’ll be credited 400 bonds (the amount for the 4th rank). Your seasonal reward in bonds depends on the total Rank Points you get for all of a Season’s stages and your position on the Season Leaders list: only players who rank in the top 50% will receive seasonal rewards. So, the higher your standing, the higher your chances at earning bonds and a crate. When the Beta Season ends, Improved Equipment, Directives, Rewards and bonds your earn stay with you. On top of that, all Beta Season participants who rack up 4 or more Rank Points will be awarded an exclusive “Ranked Battles Pioneer” medal. 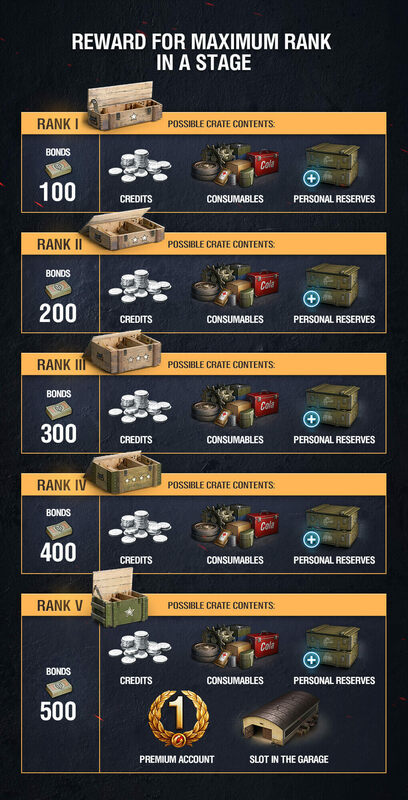 Head over to the Ranked Battles rules and regulations to explore the full list of rewards. The most tough and experienced tankers of Ranked Battles become Season Leaders. Your place on the Season Leaders list is defined by Rank Points you receive upon reaching a new rank. The more Points you earn, the higher your position, and you can check it at any time right in the game client. 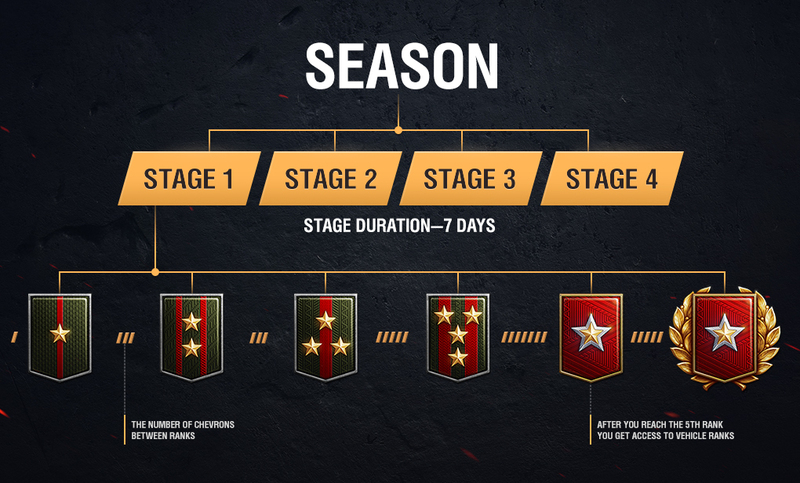 When a new stage begins, rank leveling is reset, while Rank Points are stored until a season ends. It means that the entry barrier to the Season’ Leaders list goes up after each stage and you need to keep up a great performance throughout the season to stay on the list. Your ultimate goal here is getting into the top 50% of Season Leaders and staying there until a season ends. This will earn you a place in one of the three prize leagues, a sweet amount of bonds, and unique Badges (three types depending on the league) that symbolize your mastery. They are displayed in the Garage and next to your name in all battles for everyone to see. If you'd rather keep a low profile, you can disable badges in the Player’s Account. Just left-click your username in the upper left corner of the Garage, and the badge slot to hide them. 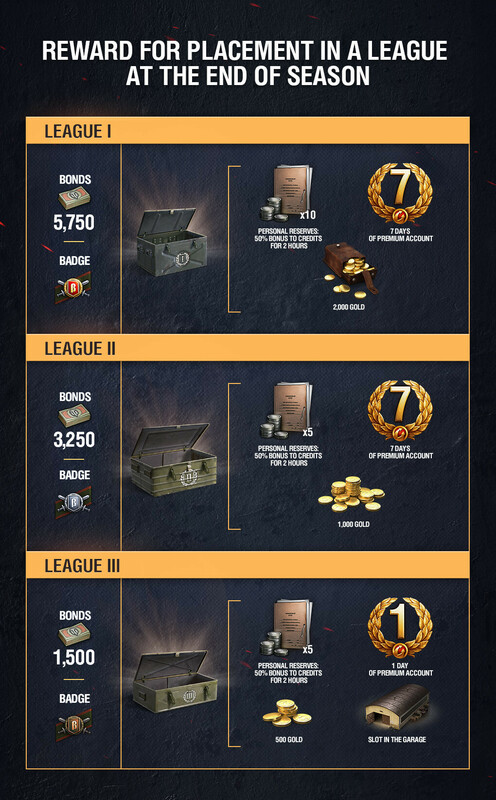 Check the Ranked Battles rules and regulations for a detailed breakdown of leagues and badges. Ranked Battles Beta Season is a testing phase, designed to collect feedback and fine-tune the mode based on what players say. We're eager to tune Ranked Battles just right delivering an experience that truly resonates with players. With the Beta Season, we're rolling out a product to let a large number of tankers test it and help define potential future adjustments. We will be monitoring player feedback in every region, collecting and analyzing your suggestions. While bonds are being introduced to the game with the Ranked Battles Beta Season, the Ranked Battles mode was not and is not intended to be the only way to earn bonds. In the future, we’ll make bonds available through other game modes and expand the list of items players can purchase with them. Along with the new mode, we have added an all-new currency, bonds, to the game. Right now, Ranked Battles are the only way to stock up on bonds, but it won't stay this way forever, as bonds are a completely standalone feature. Just as with Ranked Battles, we're testing the new currency and the new rewards. We will expand the list of items you can purchase with bonds; there will be much more than Improved Equipment and Directives for purchase. We’re also planning to make bonds available through other game modes, including ways to acquire them in Random Battles. Players will also be able to earn bonds by completing Missions and taking part in in-game specials. We may make subsequent changes based on player feedback to the functionality, rewards, and economics of the mode, including to Improved Equipment and Directives. After going over feedback and game data we collect, we'll proceed to optimize the experience by tweaking its functionality, rewards, economics, and any other element that raises concerns among players. We are tracking carefully the way Improved Equipment and Directives work and their effect on gameplay, and we may make changes to them based on that data and player feedback. For instance, we might revise Tiers and/or game modes where you can use them if a large bulk of players ask for it. All players get 100 bonds when the Beta Season begins. All players registered prior to June 3rd will receive 100 bonds when the Beta Season begins. Tankers can test the newly added Directives for crew or equipment, which also allows us to gather substantial feedback. Thanks for reading this, and thanks for your interest in Ranked Battles, bonds and Improved Equipment and Directives. We hope this clarifies our views around these features and answers any concerns you may have. If you have any further questions or comments, please head over to the forums and tell us what you think! It’s exciting to have you help shape what Ranked Battles will become when the mode launches. We look forward to your thoughts around gameplay, balance, and the progression system, and can’t wait to hit the battlefield with you on June 5!